posted: July 2, 2016, 6:12 p.m. | updated: July 2, 2016, 6:13 p.m. The weather was warm, though a slight breeze kept flowing as if proclaiming it’s existence in the dying light of the evening sun. The beer in my hand grew warm, and I kept getting a chill. I finally put on my jacket and looked about at my friend. He was busy texting, his neck drowned in his phone, probably asking his girlfriend where she was, and how long it would be until she got here. I wondered what I was going to say to her when she arrived, or even why it was necessary for me to meet her. As we waited, I watched people walk past us, lost and happy. Some football fans celebrating winning with loud calls and drunken dances. An old gentleman muttering over being distracted and distraught at the youth in it’s stupidity and glory. What caught my eye was a couple walking together, their hands entwined, eyes sharing a small world filled with great intimacy. This world contained only themselves, like two perfect mirrors faced against each other, reflecting and existing only within reflections of the other. Everything else was in a different dimension, a different realm of existence. One could make out how their bodies brushed against each other, their steps unsteady, cheeks blushing in the wind. I watched them walk past with smiles on their faces, their laughter gaily reverberating in the air. The world was full of perfect mirrors, and broken ones were condemned to solitude and sadness, unable to reflect anything back without the ugliness of their cracked realities to others. My thoughts and trance were broken by a girl walking and looking right at me. She was pretty, and walked with the confidence of knowing where she was going. Her eyes were jade, born from a blue aura that faded into golden rays around us. She had makeup on, but her beauty came from something beyond that. I was trying to find words to describe her when she stopped at our table, drew a stool, and sat down. For formalities and mannerisms to be followed, I said “Hello”, and was greeted in kind. As she looked from me to my friend, the looks and glances that they both exchanged were witness to the love and intimacy they shared, where there was no need for any expression or greeting. It felt as though the mere existence of the other person provided enough warmth for their hearts. I was happy for my friend, and her as well, two mirrors that were happy in others company, lost in the infinite reflections within each other. I looked down at the beer, and gulped it all down in one go, and although I could feel it’s warmth spread in my stomach, my heart was still too cold. A few beers later, we were laughing, and talking of things unimportant and unreal. We took turns playing the jukebox, and sang with the enthusiasm of alcohol in our veins. Songs changed, so did our moods, and our drinks. Between bathroom breaks, eating fish-and-chips, and talking nonsense, somehow I reached a point where I was drunk enough to ask one thing every friend meeting a girlfriend must. So I looked at her, at those pupils growing large in a sea of green, and asked “Why do you like him?”. I could feel the atmosphere change, and realised that it was already dark outside. I could feel my friend grow uncomfortable, his jitter apparent in his eagerness to change the topic. I could feel the songs, the babble at the bar, all the noise in the world fade out in to the background, as I looked to her, wondering, timidly, if I had cast a crack on their lives. Some people are sensitive, some people don’t have an answer. Some people are afraid, some people don’t care. I thought she was neither, taking her time to think, her eyes proof of her honesty. “Because he listens to me” was all she could manage, a struggle to say more. I smiled in return, an encouragement I hoped would not be mistaken, and asked her to elaborate. She tried, but couldn’t, all the words in the world were not enough to express the feelings of her heart. Finally she said, “It’s because he knows what to say, what to listen to. I don’t have to explain myself to me, If I’m mad he knows how to make me smile, if I’m sad, he knows how to make me happy.” And I was smiling once more, for I had heard that before, and I thought I understood what she said. But as my head cleared, and as we were talking, I realised what I had missed, and it was so trivial, and yet so important. I saw the two of them holding hands on the table, not an intimate grasp of lovers, but perhaps, as fellow companions who shared the same fear and faced the same foe. I wondered why I was thinking what I was, and whether I was too drunk to understand what was going on. But as I looked at those two again, how they looked at each other, their fingers unknowingly clasped together, my heart throbbed with emptiness. I saw understanding, I saw love. Through a thousand unsaid words, I understood the cracks in the mirrors, and though I could not see them, I could feel them, and they were beautiful in the light of love. 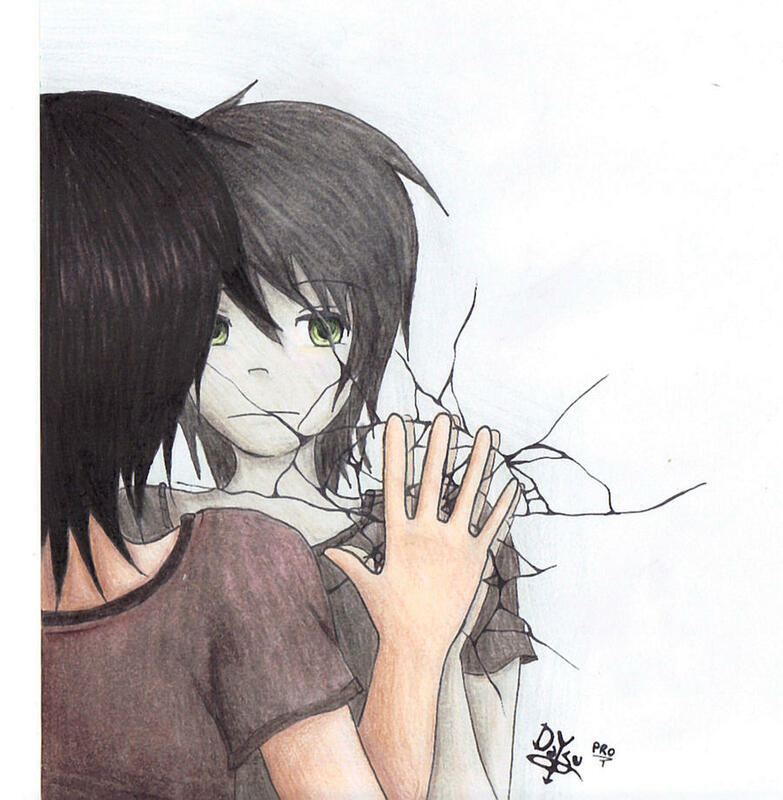 The mirrors I saw in front of me were broken, each crack different from the other. And yet they could still shine and survive, accepting their harsh realities as they stood facing each other, naked, sharing an intimacy that reflected them along with all their cracks, indistinguishable from each other. I sat there, pondering their love and it’s inherent wisdom, realising for the first time, that even broken mirrors could reflect and survive.